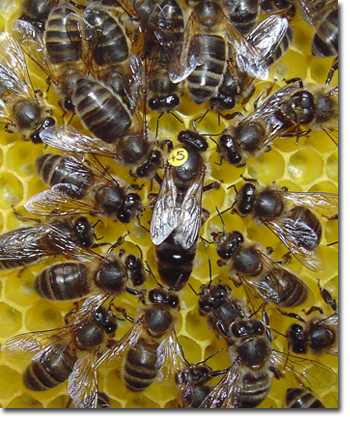 What is Apis mellifera mellifera? Apis mellifera mellifera, Linnaeus 1758 is a subspecies and northern geographical race of Apis mellifera, the western honeybee. “Det mörka Nordiska Biet” (Swedish). A.m.m. queen and court, Switzerland. Queen mated in apiary with drones of the same strain as those mating with her mother and grandmother, which were certified 100% A.m.m. by DNA microsatellite analysis. c) Behavioural characters, including colony size and development, longevity, pollen collection. 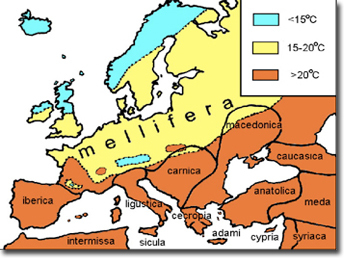 The indigenous range of Apis mellifera mellifera stretches from the Atlantic seaboard of Norway, Britain, Ireland and France eastward across Western, Northern and Central Europe north of the Alps and Carpathians to the Urals and beyond. The natural range of A.m.m. coincides with the 15-20° zone. (Copyright D.J.Pritchard).